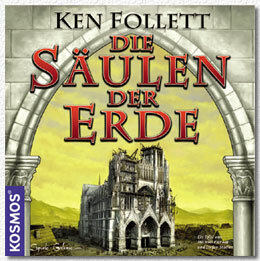 "Säulen der Erde" is based on Ken Follett's book "The Pillars of the Earth" and is yet another Kosmos game based on a literary licence. Some of you may yawn at this thought, even if you liked Knizia's "Lord of the Rings", but the biggest surprise here is that this is a true gamers' game. What could have been an average family game for the mass market has been transformed, by the excellent work of the Kosmos team, into a true gamers' game, something that astonishes when looks at the very few successful book/film tie-ins that are out there (and especially Kosmos' speckled history in that respect, even though "The Little Prince" and "Sophie's World" aren't necessarily bad games, they are just uninteresting for gamers). Players represent clans of cathedral builders who work over decades, or rather six rounds lasting roughly 90 minutes, to build a cathedral. I think gamers got the better deal compared to the guys in the book which took I think a century to finish the darned thing! single black worker meeple that will result in cries of racism on Boardgamegeek and incite endless discussions: it's there, folks, but you know - it only happens to be black. It's not a black person, ok? The colour is just a symbol. It's a white person working at the cathedral that you can hire as an extra worker. This meeple is not exploited, whipped or hurt. It is a happy meeple. We love this meeple. Peace! First comes a selection phase in which players either hire new craftsmen with new abilities or send their workers of to the woods, the quarry or the sand mine, and - if the workers are really nice - to the wool factory where they actually can earn money. Then a very interesting phase happens - one by one the three master craftsmen of each player is drawn out of a bag, and are placed at different "activity" spaces which follow a certain predetermined order. The first player to place a pawn has to pay 8 gold or he can pass, the second player has to pay 7 gold to select an action or pass and so on. Passing is cheap, but then space at the activity spaces is of course limited, and if you really desperately need to do an action you will be hard-pressed to spend money for it. Then the different activity spaces are dealt with in order. There are event cards which affect all players except the ones who have occupied a certain space, there are advantage cards which give more special favours, there are also more increasingly powerful craftsmen and there is also a market and a tax phase. After this players change resources into victory points, which depends very much on the quality of the craftsmen they have. The game mostly avoids a close representation of the book, which is limited to some flair text on the cards (and there is very little flair text), but what is there is correct and faithful. By the way - there is some German texts on the cards, but it is not much, and all the cards are open and not secret, so using a cheat sheet from the geek is easy, and in fact I've just seen that somebody has done a translation already. This is simply a very delightful and challenging game, with more than a passing resemblance to Caylus but with some aspects that make the game actually more accessible and even more forgiving. The different phases work very beautifully together, there is no downtime as all phases are interactive and the game also doesn't overstay it's welcome but is engrossing up to the end. The fancy turn counter (the cathedral IS the turn-counter, in case you wondered) made Richard Borg laugh so hard that he nearly fell out of the chair when watching our game. And it was a hearty laugh if there ever was one! But seriously - if you like involved but not too heavy games with lots of beautiful bits and pieces you should clearly consider purchasing this wonderful game. It was one of the very rare cases that a German company produced game was actually completely sold out at Essen, even though it was available in great numbers initially.